If you don’t care for your foosball table, it’ll break down way faster than you thought, and your hundreds (or thousands) of dollars invested will be flushed down the toilet. That’s why it’s so important to clean and maintain your foosball table. We’ll show you how, here. If you don’t focus much on keeping your foosball table clean, chances are that over a period of time, it will start malfunctioning, meaning that it will no longer be possible to have a clean and fun game on it. Well, now that we have an idea of how important it is to keep a foosball table clean and in perfect condition, let’s move on to learning how exactly to go about doing it. How Frequently Do You Use It? Before you get into the cleaning and maintaining part, you need to make sure that you’re aware of how frequently your foosball table is being used. 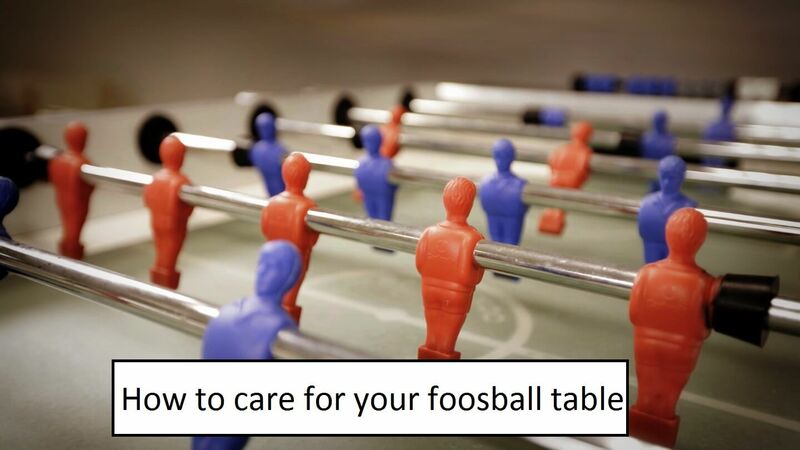 If you’re a foosball fanatic and use it very often, you may want to clean it every week. However, if you only use it occasionally, spending some time to clean it once every month may turn out to be good enough. In fact, if you play once in a blue moon, it may be good enough to put a foosball table cover on it and clean it once or twice a year. It’s important to clean all the parts of your foosball table, and not only the ones that are used more frequently, in order to ensure that the table stays completely clean and none of the parts end up getting damaged or malfunctioning. With that said, we will now dive straight into discovering some quick but highly effective tips to clean your foosball table the right way. First, you can use a can of compressed air blower to get rid of all the dust particles, especially in the corners which are hard to clean using a cloth. This will be quick and will leave you with a lot less to take care of. After being done with that, you can simply get a dry and clean cloth (it doesn’t need to be dipped in any type of chemicals or cleansing liquids), and clean every part of the table. It’s actually also recommended to clean the legs of the table, as they too tend to get dirty and wear down over a period of time. When you’re done with this, you’ll probably notice that there are still some spots that you didn’t managed to get rid of. However, it’s nothing to be worried about, as they will be taken care of in the next step. Now, you can get another clean and soft cloth, apply some rubbing alcohol (shouldn’t be more than 70%-80% in volume) to it, and clean all the parts of the table again. However, you need to make sure the rubbing alcohol is used in very low quantities or it may end up leaving a residue or bad smell. This step should get rid of almost everything, including the hard-to-remove stains. Some stubborn stains may need more work, though. Although, if you have stains on your table, maybe get a cover no matter how often you play, or clean up as soon as something spills. Finally, you should apply foosball silicone on the rods of the table. This will give them a slick but not slippery finish, and will make them smoother. However, never use WD-40 instead of silicone, as it may make the rods extremely smooth initially, but would eventually end up degrading them.